LIC Term Insurance Plans are the most basic form of life insurance policies. The LIC Term Plans are designed to provide affordable death protection for the short term and pays a benefit only if you die. LIC Term Insurance Plan is often less expensive when compared with other types of insurance, especially when the policy is purchased while the policyholder is younger in age. Hence, read the complete article to know more details about the LIC Online Term Plan. 1.1 Why LIC Term Plans? The LIC Term Plans are traditional insurance plans that cover the life of the insured in critical situations like unfortunate accidents which lead to the death of the insured person within the policy period. The LIC Term Insurance plans offer protection to the life assured at a low cost. These LIC Term Policies provides some benefits in case if he/ she dies during the policy tenure. That means in the event of death; the company will pay all the benefits to the nominee. The policyholder will not get any maturity benefit at the end of the policy term if the policy period is completed. So, any person with a low income and looking for a large cover to protect his family’s financial future can buy LIC Term Policy. These are also referred as a basic form of insurance since they provide only for the death of the policyholder during the policy term and no maturity value. You can renew your LIC Term Insurance policy by paying premiums to get the benefits under this plan. You can calculate the premium to be paid by using Term Insurance LIC Premium Calculator. Term insurance plans from Life Insurance Corporation are preferred by most of the people even though there is no maturity benefit because it allows them to buy a high amount of coverage levels at very low premiums. Due to this, one can secure their family against any loss of income which the family members might face in the absence of the life insured. Hence LIC Term Insurance plans are cheap when compared to the other insurance plans. The different plans available under LIC Term Insurance plans are LIC Amulya Jeevan policy-II, LIC Anmol Jeevan policy-II, LIC E-term policy 825, New Term Assurance Rider, LIC New Jeevan Mangal Plan 840, LIC Bhagya Lakshmi Policy 829. Here we have provided details about all the LIC Term Plans. You can also get details from the LIC India official website, i.e., www.licindia.in. Any person between the age of 18 to 60 years can take this policy for a maximum policy term of 35 years. If the death of the policyholder happens within the policy period, then the sum assured will be payable to the nominee as a death benefit. The nominee will not be paid by any benefits up to 12 months if the death of the policyholder arises due to Suicide/ attempt to suicide. You can get a Tax benefit under section 80C for the Life Insurance premiums paid up to 1,00,000/-. No maturity Benefits are available in Term insurance plans, on the survival of Policyholder until the policy term expires. For example if you have taken the LIC Term Insurance policy at the age of 35 years for a policy term of 25 years and if you have opted yearly premium payment mode, then you have to pay 3587/- as premium annually and the company will pay sum assured of Rs.1,00,000 on the death of the insured person as a death benefit. The LIC Anmol Jeevan – II policy is a pure Term Insurance plan. LIC Anmol Jeevan – II policy provides financial protection to the insured’s family in case of unfortunate death. The Anmol Jeevan- II plan is a current regular premium paying insurance plan without any profit. The Amulya Jeevan II Plan is one of the best LIC term insurance plans. This plan was introduced on 3rd February 2014. If the death of the insured person happens within the policy period, this plan provides financial protection. On the survival of the policyholder, he/ she will not get any maturity or survival benefits. The LIC New Jeevan Mangal Plan is a Micro Insurance Plan with term insurance features. LIC’s Jeevan Mangal Plan is a protection plan with return of features on maturity. Under this, the individuals may pay the premiums either in a lump sum or regularly over the policy tenure. This New Jeevan Mangal Policy also comes with an inbuilt Accident Benefit to provide double risk cover in case of accidental death. The LIC Bhagyalakshmi Plan is a non-participating limited payment protection oriented plan with return of 110% of total amount of premiums payable on maturity. Where the premium paying term is 2 years lesser than the term of the policy. LIC India has introduced this New Bhagyalakshmi policy to serve the distinct needs of the people with low income. You can pay the premiums in monthly, quarterly, half-yearly, and yearly modes. LIC Term Plans comes with numerous advantages. So, let’s have a look at these benefits below. Term Insurance is expensive. So, most people as long as they have an income can afford to buy these policies. LIC Term Plans offers death protection insurance at a fixed rate of payment for a limited, specific period. The term plans of LIC are easy to understand when compared to that of endowment plans which provide combine risk cover with savings. The premium for term insurance plans is much lower than that for similar cash value policies. These are best suited for young families. Because most of the young families are financially stressed, rushing the costs of caring for small children, a loan, saving for college and retirement and other expenses. Also, the term plan LIC offers guaranteed rates. The premium for term insurance policy increases with advancing age, and hence insurance needs at higher ages cannot be economically met with term insurance. It becomes difficult to buy an LIC Term plan at your old age say beyond 65 or 70. If in case, the corporation offers LIC Online Term Plan at ages beyond this, several conditions, disadvantages are attached. 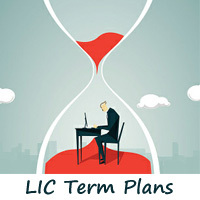 LIC Term Plans doesn’t involve any surrender values or loans.